You can still unlock your car even with a dead key fob. If you’ve just found yourself locked out of your car with a dead key fob, we may be able to get you going. If your remote key fob has given up the ghost in the parking lot of a shopping center, you may be in luck. The battery may have failed, and getting it to work again might be as easy as replacing it. To access the battery, you’ll have to open the fob. Typically, you have to use a coin or a small screwdriver to pry the battery cover open. The battery will look like a silver button. Look for the numbers on the battery and match those to a replacement battery. Using the Audi MMI connect App, Audi owners can utilize remote unlocking services if the key fob is dead, or if the key is inside the car. You can learn more about the app and sign up at Audi’s website. Vehicles equipped with AcuraLink can receive a remote unlock signal to get into the car if the key fob is dead. The service is available through the app, or via PC. Learn more at Acura’s website. FCA vehicles equipped with Uconnect are eligible for remote unlocking services if you’re currently a Uconnect subscriber. For more information on the program, visit the Uconnect website. BMW offers remote unlocking services via its Connected Drive program. For more information on BMW, visit the Connected Drive website. Since the 2014 model year, the General Motors brands have made OnStar RemoteLink Mobile App services standard for five years, even if you’ve declined to pay for other OnStar services beyond the trial period. If your key fob is dead and you haven’t downloaded the OnStar app, go ahead and do it and get in touch with an OnStar operator to see if they can unlock your door remotely. You can also contact OnStar on the phone at (888) 466-7827. Vehicles equipped with Sync Connect — 2016 model year forward — can remotely unlock their vehicles using the Sync Connect app. Owners need to enable SYNC Connect through a two-step authentication process to protect personal information, confirming setup on the vehicle touch screen and on the mobile application. Information on the service is available at Ford’s website. Honda doesn’t have a satellite-based unlocking service, but its roadside assistance program will send a technician out if your key is lost, locked inside or broken. For more information, visit Honda’s roadside assistance program website. Hyundai’s BlueLink services include a remote unlocking feature if your key fob is dead. You can access services from the app, a PC or by phone. For more info, visit Hyundai BlueLink. Nissan Connect allows owners to unlock their cars remotely via the app or the web portal. For more information, visit Nissan Connect. Infiniti vehicles have a similar service through Infiniti InTouch. Find out more at the Infiniti InTouch website. Jaguar’s InControl Remote & Protect services include remote unlocking if the key fob is lost or damaged. Visit Jaguar’s website to learn more. Land Rover offers the same program. Visit the Land Rover website for more information. Kia vehicles equipped with the UVO system have remote unlocking services as part of the program. You can learn more about how to access the services at the MyUVO website. The Lexus Enform telematics system features remote unlocking services. You can learn more about the program at Lexus Enform’s website. Mazda doesn’t offer remote unlocking services on all its vehicles, or even all of its vehicles within a certain model. Mazda Mobile Start (which, as the name implies, also allows you to start the car remotely) can unlock the doors on 2016 and forward Mazda6 and Mazda CX-5 models with an automatic transmission. It does require installation, though, so unless you bought the option, it won’t help you in an emergency. The rest of you should contact Mazda’s Roadside Assistance program for lockout services. Vehicles equipped with Mercedes-Benz’s mbrace service can request unlock services via the mbrace app, computer or by calling the mbrace Response Center. Information on how to execute an unlock is contained in this .pdf at Mercedes-Benz’s website. Mini doesn’t have remote unlocking services, but if your remote is dead, you can still get inside the car through the roadside assistance program. You can also hail Roadside Assistance using the app. Mitsubishi doesn’t offer remote unlocking, but its lengthy free roadside assistance program can get you into a car with a dead fob. Learn more at the Mitsubishi Roadside Assistance program. Porsche owners can unlock their vehicles with a bad key fob using the Porsche Car Connect program, at $119 per year. For more info, visit the Porsche Car Connect website. Subaru owners with a malfunctioning key fob may be able to unlock the car remotely if they’ve subscribed to StarLink. For more information on the program, visit the StarLink website. At the moment, Toyota vehicles don’t have satellite-based remote unlocking services, but within the period of Toyota’s roadside assistance program, you can get inside with the help of an actual human. Visit ToyotaCare for more information. Volvo On Call provides remote unlocking services when the keys are lost, inside the car or the fob is damaged. Visit the Volvo On Call website for more information. Vehicles equipped with Volkswagen’s Car-Net service can have their VW unlocked remotely, as long as they’re signed up and a have a cell signal. More information is available at VW’s Car-Net website. If you don’t have one of the services described above, you can still try calling Roadside Assistance. The number is typically posted on the side windows, and in the owner’s manual. Barring that, try holding your dead fob up against the driver’s door handle and pulling. Sometimes there’s just enough juice in the battery to unlock it at a close distance. If that fails, look closely at the fob. If it has a leather jacket on it, remove it. 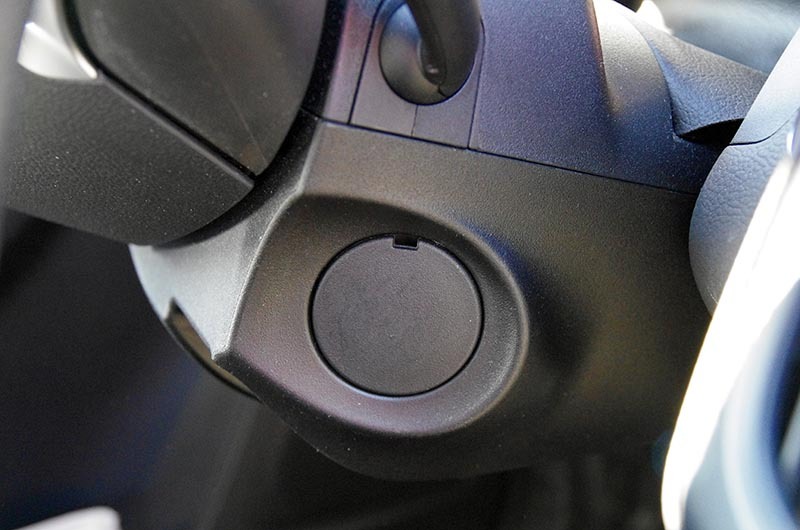 Almost all automakers hide a small mechanical key inside the fob. There is usually a small catch that allows the spare key to pop out. If you can expose the little mechanical key, you can then insert it into the lock opening in the driver’s door, and you’re in. Once you’re inside, getting the car started is actually pretty easy. Automakers know that your keyless ignition may need to work if the fob dies, and the system has been designed to work even with a non-functioning remote. Some cars are equipped with a means of starting the car manually, and some have a backup built into the key fob that work without a key. Even if your car has keyless entry, you may not have noticed that there’s actually a key slot somewhere on the steering column. Mazda vehicles, for example, are equipped this way. The “switch” you turn is actually a plastic cap that pops off, revealing a key slot underneath. If your keyless entry works with a START button and there’s no mechanical key slot, there’s still a way to start the car. Use the key fob to push the START button. Some manufacturers have a backup system that allows this method to work if the key fob battery is dead.